Michael Mann. Image via Slash Film. 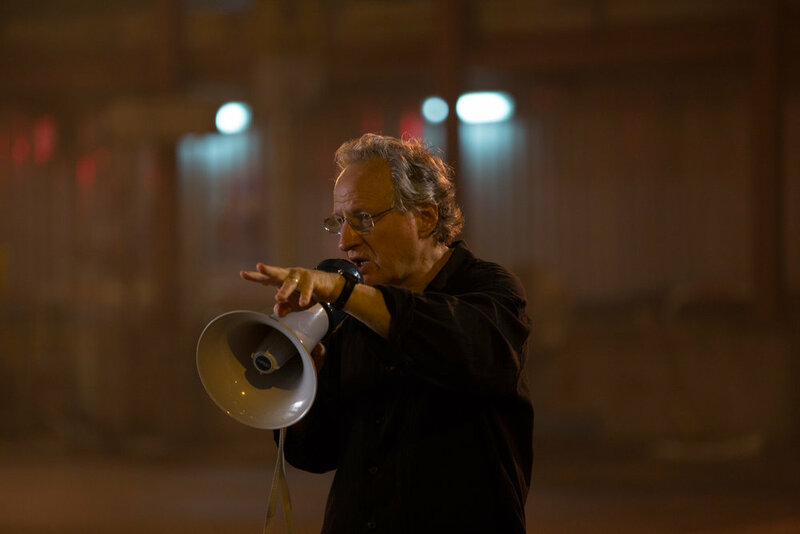 Director Michael Mann turned 75 last month. Mann's body of work places him in a category of few other directors. This work includes 'Thief', the mid 80s Chicago crime movie that used urban landscapes to portray, as Mann called it, a "left critique" of modern malaise; the stylistic cinematic introduction of Hannibal Lecter, 'Manhunter,'; the start-studded 'Heat' that used the L.A. sprawl to follow a narrative driven by the decisions of its flawed characters; the examination of journalism, angst, and the importance of the truth in 'The Insider'; 'Ali', the imperfect but powerful biopic of a boxing legend; the night-based, contemplative 'Collateral'; and more. My relationship with Mann's work is somewhat personal. He was my late father's favorite director, and my father's favorite film was 'The Last of the Mohicans' — my dad called it a "classic adventure story." Once, when I was talking to my father about 'Public Enemy', he, not knowing who directed it (he saw it on TV), guessed that it was a Michael Mann film. "I was watching this and thought to myself, this must be a Michael Mann movie." "One can often recognize a Mann film after the first few minutes of screen time because his films bring together so many disparate elements – the crime genre, aspects of the documentary, a wide repertoire of shots and camera movements, exquisite sensitivity to color and sound – in such fruitful ways that what might appear as mere eclecticism in the work of a lesser filmmaker emerges in his films as a coherent whole." Growing up, there are names associated with pieces of art that you recognize, but may not know anything more about them. They have a sort of mystery. Mann was one of those names. I remember reading about 'Collateral' when it came out, and I saw it on TV a few years later. I was immediately moved by it. I knew nothing about Mann at the time; there was something about the film that drew me in. 'Collateral' (2004). Image via Tumblr (ILoveMovies). The story in 'Collateral' is pretty standard territory for Mann; it's about a hitman, Tom Cruise, who uses a cab driver, Jamie Foxx, to carry out a night of jobs. Mann's films, and this is noted throughout the literature on the director, often find characters (usually male) stuck in a trade (usually crime) due to their aptitude, and, while they may long for escape, find that they keep running into themselves, to paraphrase James Joyce. Mann is often a genre filmmaker. Some aren't fans of these themes; some are. What interests me, and what drew me to Mann's work and 'Collateral' in particular, was the longings his characters express. There is a scene where Jamie Foxx shares with Tom Cruise his dreams of owning his own limousine company. His earnest desire for escape, mixed with its seeming distance, resonated with me. Later in the film, Cruise pushes Foxx on this: "someday 'my dream' will come? One night you'll wake up and discover it never happened." Often, our day-to-day reality, mixed with our internal dialogue, stops us from taking steps toward where we want to go. 'Collateral' — a hitman movie — drove this point home for me. Per Paul Thomas Anderson's quote, we remember the way movies make us feel. Mann is stylist known for using the urban settings of his films to elicit emotions, and almost act as primary character. “[At night] the world becomes a lot more thematic.. instead of the landscape being something flat that got laid on down planet earth with the whole open sky..it’s like your in a room suddenly - there’s a lid on everything. So then the city becomes... less of a flat plane.. it becomes a three dimensional machine that you’re moving through.” - Interview. 'Collateral' was one of the first films to embrace digital technology; digital in 2004 was still a new technology and not on par with film — much different than the digital dominance of today. Digital is good for night exposure, since it doesn't involve the external light requirements and pushing of the film stock that goes with celluloid. There's also a fluidity of the motion that a viewer can quickly notice in Collateral. The club scene, for instance, is on film, and looks much different than the rest of the picture. Mann's expressionism, particularly in his mid 2000s films, led me to discover the work of Wong Kar Wai, further developing my own film education. Mann's work, starting with my experience with 'Collateral', introduced to a younger me the type of inarticulable sensibilities inherent in the cinema I gravitate toward. Artistic Influence. An Alex Colville painting influenced this shot in 'Heat' (1995). Image via Cinetropolis. Mann's layers light, sound and color on top of stories that involve characters confused in a modern world, who use discipline to try to navigate the maze. This discipline may lead them to grow, or may keep them in place. The oft urban settings of Mann's pictures, whether night ('Collateral') or day ('Heat'), provide a backdrop to this sense of alienation. They are lonely individuals in a world that, ironically, has so many inhabitants right nearby. "They’re self-aware. There’s a design to everything Hanna does and everything McCauley does. Being that inner-directed, though, brings a certain solitariness, which makes them the only two men like this in the universe of the motion picture." - Graham Fuller's interview with Michael Mann, on 'Heat''s main characters. The mix of Mann's artistic impulses and themes have a lead to a potent style of filmmaking that I have found myself continually drawn to, and that has loomed larger in my growth as a viewer. I finally saw 'The Last of the Mohicans' this month. Ironically, there is no city in this movie. The sense of change — and how the characters' microcosmic journeys demonstrate, subtly, the societal forces shifting around them — unites this film with the rest of Mann's work. A Michael Mann movie indeed. Through genre, Mann shows the effect that the surrounding society has on the people who move through it, posing questions, rather than answers, on how an individual can attempt to find meaning in a perplexing world.